The Mud Creek Boys, an acoustic trio based out of Wolfville, Nova Scotia, play an eclectic mix of old-time country, bluegrass, blues and swing. They especially seek out those “old tunes that everyone remembers but no one plays anymore”. 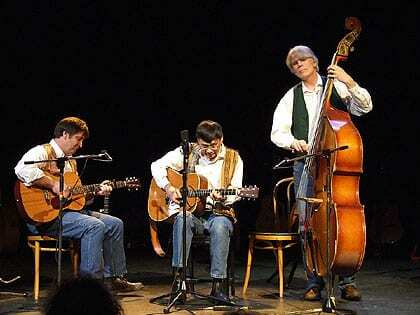 J.P. Huang plays guitar and mandolin, Peter Williams plays guitar and bass, and Ian Spooner plays banjo and guitar. The Mud Creek Boys have performed in many different venues across western Nova Scotia, and been part of a showcase at the Lunenburg Folk Festival. To a great extent, their repertoire draws from traditional sources, such as the Delmore Brothers, the Carter Family, and Woody Guthrie, but numbers by contemporary artists, such as Alison Krauss and Union Station, Peter Rowan, The Beatles and The Dillards, also find their way into the mix. Special guest Gary Ness, now a retired professor who was with Acadia University for many years, joins the Mud Creek Boys, for the “train show.” Gary is a historical train enthusiast and has written two books on the Dominion Atlantic Railway. As part of the “train show,” he will tell stories about trains and share from the vast collection of train photos he has collected over the years.